This unique project cannot be framed as a refit or as a new build but is the perfect example of a rebuild. In 2015 Sandalphon (also known as Project Gisele) came to the premises in Urk after her Owner granted Balk Shipyard the project due to its good reputation as a refit and rebuild specialist and its heritage. Now Sandalphon is ready to be launched and to discover the world. It sure was not a typical refit, as the yacht was stripped down to only her bare casco and completely rebuilt from square one. After being examined by Azure Naval Architects concluded was that Sandalphon had to be extended with several meters to get her in the best shape and balance as possible. “This project has been challenging for my team. Stripping down a yacht and rebuilt it again might be a harder job compared to new build”, comments Daan Balk – CEO of Balk Shipyard. Decided was to cut her in halve - twice. Once right across the midship where she has been extended with three meters and once at the aft ship where she has been lengthened with one meter, which gave her a total LOA of 31 meters. Besides these major extensions every area has been judged and if necessary restyled, redesigned and custom built in close cooperation with Azure Naval Architects. “With hard work, expertise and dedication we have achieved the best result as the Owner wished for”, Daan continues. “Our first cooperation has been very successful and I sincerely hope we can make this a long term cooperation”, says Erik Spek, Managing Director of Azure Naval Architects. With an interior and exterior design by Azure Yacht Design Sandalphon has turned into a sturdy yet elegant explorer yacht. With many key features, next to that a bar and lounge area on the top deck with panoramic views and a wide variety on water toys she will offer her Owners ultimate explorer experiences. Her German Owner stated: “Sandalphon has turned into an elegant explorer”. With her matt finish in Futura Dark Grey she sure will turn heads. 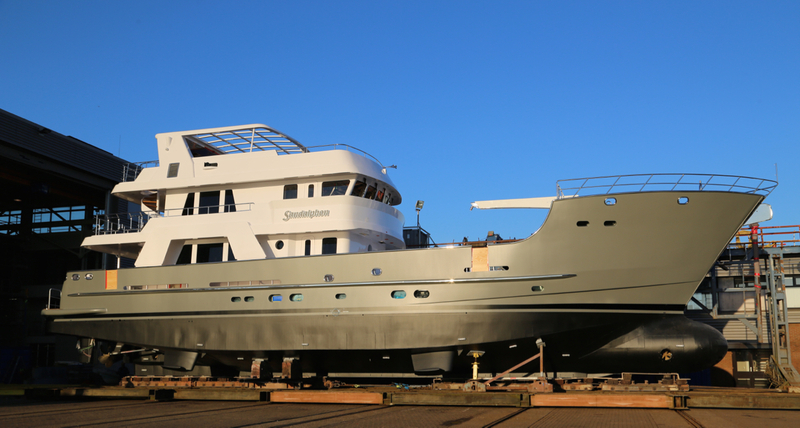 Sandalphon has been launched on Thursday April 20. Her delivery is due end of May / beginning of June after her commissioning and extensive sea trials. Please watch her launch video below.